Motorbikes and plastic chairs occupy the sidewalk of Ly Tu Trong Street in District 1, Ho Chi Minh City, May 20, 2017. 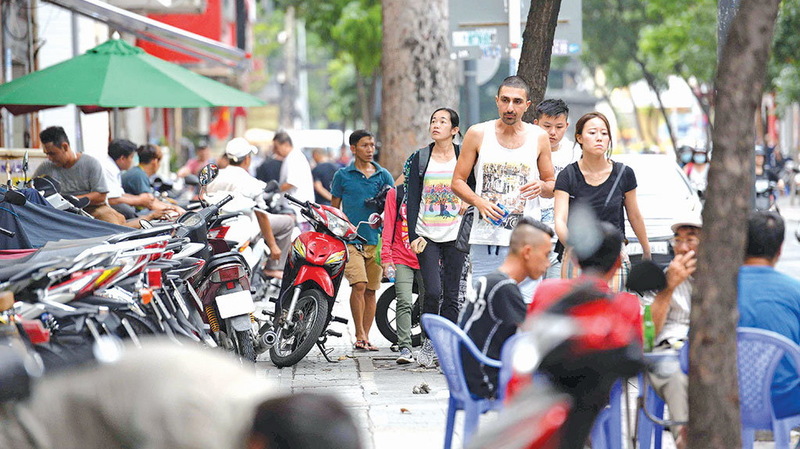 Sidewalks in Ho Chi Minh City are once again in disorder as the initiator of the sidewalk clearance movement says he is not allowed to continue leading the campaign. Locals complain vendors and business owners have re-occupied the sidewalks after seeing inaction from city authorities over the past few weeks. “At first, there were drastic measures taken by authorities [to clear the sidewalks], but after a month or so they stopped enforcing the rules,” said Nguyen Thi Nhiem, a business owner on Bach Dang Street in Binh Thanh District. “Some locals jumped at the chance to resume their occupancy of the sidewalks. The situation now is hardly any different than it was before the campaign, except for the newly-painted lines,” she added, referring to the boundaries marking the areas where things can be placed or vehicles can be parked. The ‘sidewalk reclamation’ efforts began on January 16 when Doan Ngoc Hai, deputy chairman of District 1, led a team of district officials and police officers to fine those who occupied the sidewalks on multiple streets in the downtown area. The fight against sidewalk encroachment was stiffened in February when Hai set out to demolish even parts of state-owned buildings and to tow away cars that were parked on the footpaths. The deputy chairman, who by then had been dubbed by local media the man with the ‘sword of power’ to restore order on the city’s pavements, even had concrete steps and ornamental tree boxes of five-star New World Saigon Hotel and its next door Starbucks outlet in District 1 destroyed for blocking the sidewalk. Even the Ho Chi Minh City branch of the State Bank of Vietnam was not spared from Hai’s justice as he ordered the removal of a chain barrier and several police-approved security booths that occupied the sidewalk outside the building. Hai even booked vehicles bearing diplomatic number plates when he found them to be illegally parked on the sidewalk. Many then said he broke diplomatic rules but he insisted he did not, as he only fined drivers of vehicles that did not qualify for diplomatic immunity. His campaign inspired other districts in Ho Chi Minh City to take up similar measures and gave rise to a nationwide movement to reclaim pavements for pedestrians. However, after a few weeks of inaction from Hai and other district administrations, many of the sidewalks in District 1 and across Ho Chi Minh City that had been cleared in the campaign are now once again in disorder. In District 1, people have started to park their motorbikes and cars all over the sidewalks on major streets, ignoring the painted lines indicating the parts reserved for pedestrians. The same scenario is observed in District 3, where customers of stores on either side of Nguyen Dinh Chieu and Cach Mang Thang Tam Streets leave their bikes on the sidewalks without fear of being fined by officials. Street vendors have also returned to the pavements of Binh Thanh District, where they occupy an entire section of the sidewalks to place plastic tables and stools to accommodate diners. On Kha Van Can and Vo Van Ngan Streets in Thu Duc District, most stores have re-installed their billboards and canopies that were once removed by city officials. At night, cars being parked along the pavements outside restaurants across Ho Chi Minh City is a common sight despite previous efforts to tow them away. Doan Ngoc Hai, the key figure in District 1’s ‘sidewalk clearing’ campaign earlier this year, says he has been forced to stop getting down to the streets to direct the campaign due to orders from the district, according to local media. Hai admitted that disorder had returned to some pavements, but that there was nothing more he could do since he was no longer in authority to direct the campaign. Meanwhile, Ho Chi Minh City authorities have denied that they have forfeited efforts to reclaim sidewalks. Nguyen Nam Hai, head of Thu Duc District’s urban management, said most permanent structures previously occupying sidewalks in the district had been removed. However, Hai admitted that sidewalk occupancy by motorbikes and cars is still a problem. “We have maintained regular inspections, and repeat offenders will have to pay heftier fines,” Hai said. In District 1, ward-level administrations and district-level urban management bodies will go on with the campaign, according to Lam Ngo Hoang Anh, chief of office of the People’s Committee of District 1.